Dishware is food and dishwasher safe. Not oven or Microwave safe. This piece began with sheet glass cut into 1/4” strips and placed on edge. It was fused in a kiln to combine all of the pieces to make one flat piece. It was put back into the kiln and “slumped” at a lower temperature on a mold. The glass takes the shape of the mold. This piece can be decorative, functional or both. 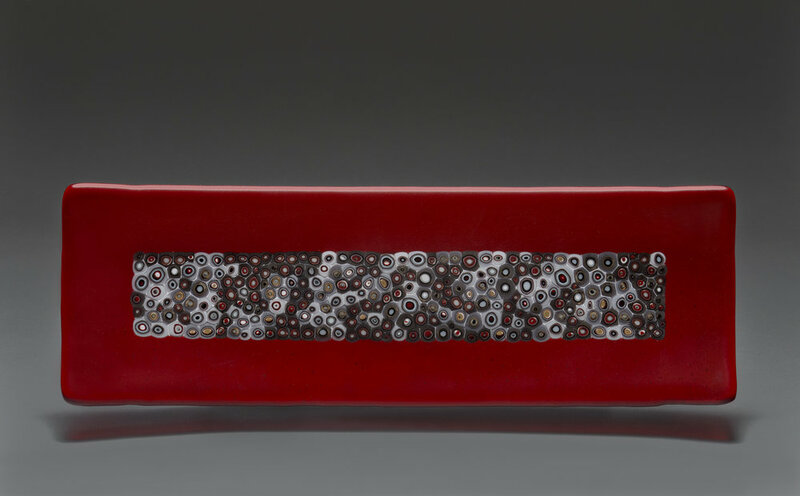 This platter began with 1/4” strips of sheet glass placed on edge with some glass “windows” that were made ahead of time and incorporated into the piece. This piece can be used for display, functional or both. This Piece incorporates colored patterns made in glass a glass cane that are revealed when the cane is cute into cross sections called murrine which I pre-make. Two layers of glass are cut into the desired rectangle shape and the design is cut from the middle section. I place the pre-made murrine into this section and fuse the components together to make a flat piece. It is then placed on a mold and “slumped” in the kiln to assume the shape of the mold. Two layers of glass are cut into the desired rectangle shape and the top piece is cut to create a colored border. I place the pre-made murrine into this section and fuse the components together to make a flat piece. This piece was sandblasted which creates a matted finish. It is then placed on a mold and “slumped” in the kiln to assume the shape of the mold. I cute a ring from a 16” circle of glass and then a smaller circle and incorporated the murrine into the final design. The piece was fired in the kiln to create one round flat piece and then placed on a mold, put back in the kiln at a lower temperature and the piece took the shape of the mold. This set started with 2 layers of sheet glass with white glass on top. The patterns were created using stencils an sifting glass powder over the the stencils. The pieces were then fired and the glass and glass powder became flat. Each piece was then put on a mold and “slumped” in the kiln at a glass warming temperature and the glass took the shape of the molds. 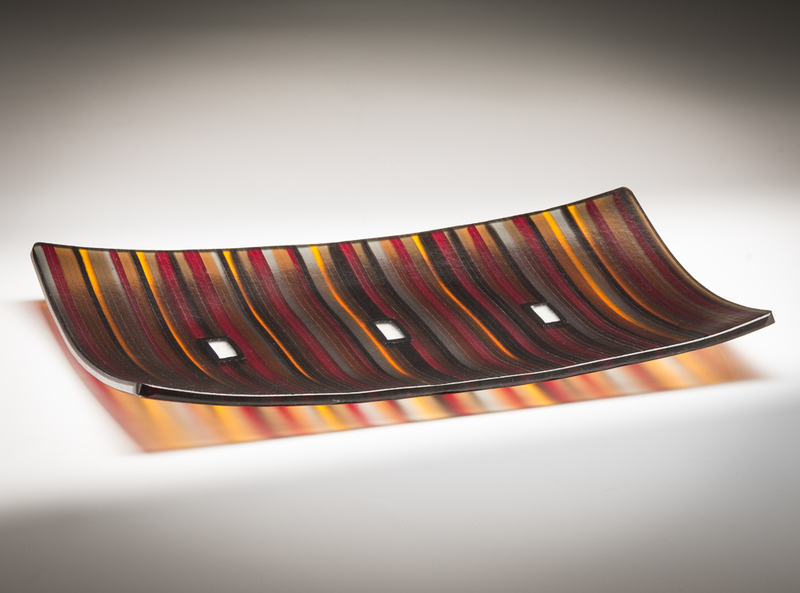 This piece was created using green glass and 1/4” strips of two other colors of glass placed on end and fused together to make one oval platter. The piece was sandblasted and slumped giving it’s shape.